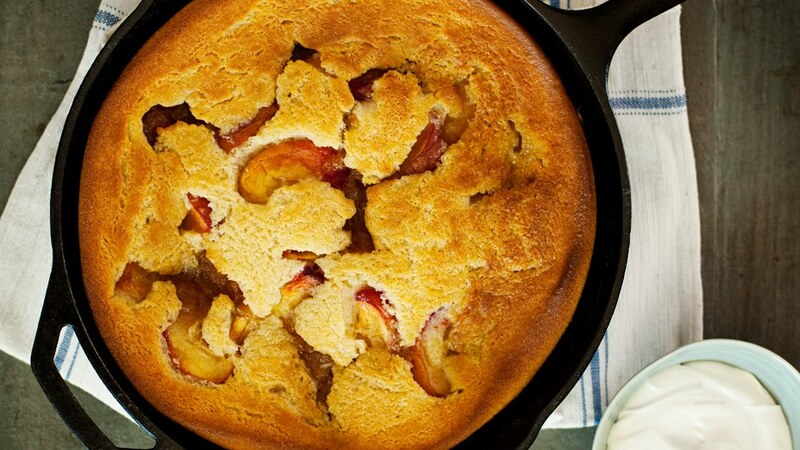 There's nothing that tops a classic peach cobbler recipe crisped to perfection in a cast-iron pan. And this recipe garners some bonus points with whipped cream doctored with crème fraîche. Decadent and delicious. Preheat oven to 350°. Whisk first 4 ingredients in a medium bowl. Whisk eggs, 1/2 cup crème fraîche, milk, and vanilla in a medium bowl. Add egg mixture to dry ingredients; whisk until smooth. Melt butter in a 12 inch cast-iron skillet over medium heat. Swirl pan to coat with butter. Remove from heat. Add batter to pan. Scatter fresh peaches over, then spoon dollops of preserves evenly over batter. Bake until a tester inserted into center of cobbler comes out clean, 45-50 minutes. Let cool slightly. Meanwhile, whip cream in a medium bowl to form soft peaks. Fold in sugar and remaining 1 cup crème fraîche. Cut cobbler into wedges and serve with whipped cream mixture.